This is a long drive from Banff up to Jasper, mostly following the Athabasca River. On the way there are many places to stop to admire the scenery and the birds. Most of the lakes, however, look desolate and need a stop to see if anything is about. Lake Herbert held Goosander, Lesser Scaup and Canada Goose; nothing was seen on any of the others. A major tourist spot is the Athabasca Glacier, worth a stop anytime. Birdwise there are two small lakes, one at the base of the glacier and one nearer the restaurant. On May 29th the latter held Mallard, Green-winged Teal and a pair of Cinnamon Teal. 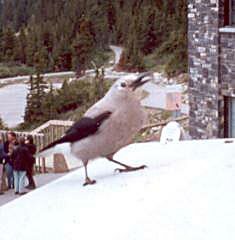 The restaurant balcony is great for Clark's Nutcracker; these birds are typical crows, trying to get food from people and rubbish bins. Common birds seen en route were Yellow-rumped Warbler and Brown-headed Cowbird. Nearer Jasper Sunwapta Falls is really a roadside stop for tourists, although it does have facilities for overnight stays. The restaurant does have hummingbird feeders but we weren't lucky. We did hear that after we left Rufous Hummingbird was seen feeding from one of the feeders! In the trees around the buildings were seen American Robin, Yellow-rumped Warbler, Pine Siskin and a superb and much-wanted Varied Thrush. Locals seem to think the latter bird is common but if you want to see one it isn't! Further towards Jasper is another waterfall, the Athabasca Falls. Again full of tourists but we did see one Vaux's Swift here.